Two months ago, I arrived in Paris for my first study-abroad experience during my academic career. I had to take two flights; the first from Tripoli to Tunisia and another from Tunisia to France, as the Libyan airport no longer operates flights to Europe. The visa procedure was one of my biggest concerns as well because we no longer have a French Embassy in Libya. Similarly to my US visa application before, I had to travel to Tunisia to apply for a French visa. It went smoothly, but I had to wait for two weeks. Usually, a student visa only takes about a week to 10 days to be issued. I have had the dream to obtain a master's degree since I was very young, although I was uncertain what field I would pursue. Regardless, I was determined to “keep my eyes on the prize.” Nothing would stop me from reaching the masters degree level in my education. Once I reached high-school, I became more concerned and involved with environmental issues around the world and subsequently, when I reached university, I decided to study chemical engineering and will pursue my master's degree in environmental studies later on. In the years following, I spent time as a teacher gaining work experience before applying to a master's program. However, my dream to study abroad persisted. It made sense to consider a study abroad experience that would allow me to learn about another country while also advancing my studies. After months of preparations and several rejections and and a few acceptances, I had finally made it to my long awaited dream. I started my graduate studies in Environmental Policy at the Paris Institute of Political Studies, commonly referred to as Sciences Po. It is one of the most prestigious schools in Europe in political sciences, and a significant number of politicians and change-makers have graduated from it. The school includes many departments that students can benefit from in the future, and provides access to jobs both, in the students’ home countries and Europe. As a member of the “The Libyan Youth Climate Movement,” I have worked on raising awareness to address the impact of the environment on social construct in Libya. I wouldn’t say that it is easy to connect my field of knowledge with my country since there is a considerable gap to be filled regarding this matter. I hope that in two years time I can contribute to implementing environmental policies. I believe that once the policies are activated, the outcomes of the field will be more tangible and accessible to many. I am still in my first year, and so far it has been a great but a very challenging adventure to be here in France. The first challenge I am still struggling with is the language barrier which is French. I only speak Arabic and English, and French is not a language I ever thought of learning before. I learned English when I was in primary school, and I made a lot of effort throughout the years to understand the language basis and culture to be fluent in it. I am currently learning French, but I am still a beginner. I am aware that I need more time and "courage" to break the barrier and start interacting with it. Thankfully, my program is entirely in English, and even if the professors are French, they are obliged to speak English. As a Libyan, I believe that I can represent Libyan women in my study abroad program in France. I come from an enclosed society that puts pressure and boundaries for women to live their lives and practice their rights freely. Some family members and even individuals in our community still considered it odd that my parents are supportive of my decision to study abroad. Some still think that I am supposed to get married rather than get an “extra” degree as they described it. Furthermore, other individuals thought that there was no use for me of taking such a step, and educating myself further. A man told my father the other day that I should’ve gotten married first and then traveled with my husband. My father replied that I was a grown-up and that I had the freedom to shape my future with or without a man––A future I can pursue and make the most of. He also added that I am capable of doing things that some men who go abroad wouldn’t be able to do. My father’s responses left the man without any further arguments to add. Another challenge I face while in France is the endless paperwork required to legitimize my stay here. The amount of official documents I am to finish is far from being complete. The bureaucratic processes can get frustrating at times, but I have developed patience and learned so much from doing everything on my own including the paperwork. Completing this paperwork is essential in order to gain full access to many services in France for the next two years. I have also come across strangers who helped me on many occasions; whether in the metro station or the laundry room next door, showing me how to use the washing machine. 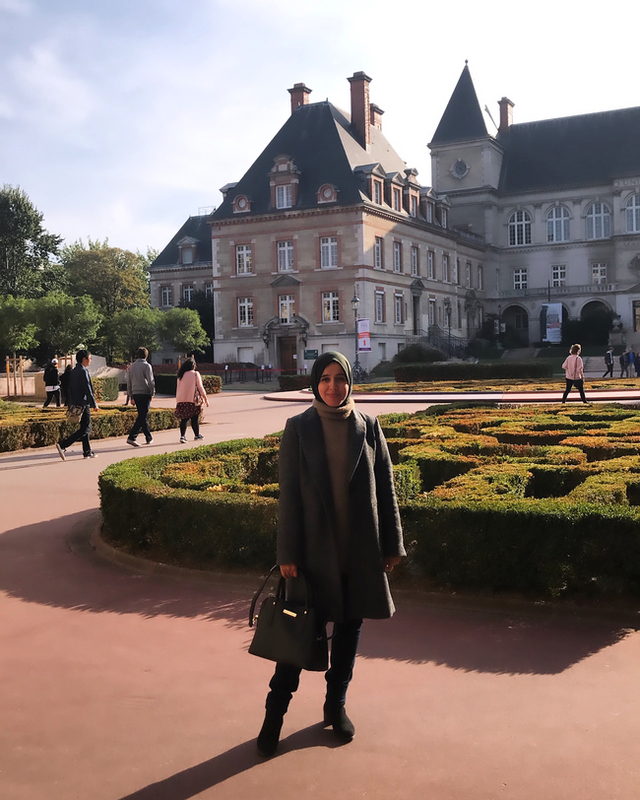 I have found Muslim women attending classes Sciences Po who are always ready to help me with school, and we have managed to gather and meet as a group regularly. Our interactions also happen through a group on social media due to our busy and tight schedules. Meeting them made me feel welcomed. Knowing that I have people to reach out to with a shared culture and go also on runs with made me feel like I was no longer a stranger to certain extent. Most of them are from Ghana, Morocco, Tunisia, Turkey, Indonesia, Algeria, France, and Syria. The diversity of the group is also what made me so interested to bond with them. We use Arabic, English, and French to communicate with one another. I also got to know foreign girls from my school who are French, Americans, Indians, and their help and advice have been amazing. While there may not be many Libyans, the Arab community as a whole remains very well-connected. The grocery store salesman that I mentioned before, who is Algerian and who has helped me on my first days, even introduced me to his family. It is not very hard to connect with Arabs here! The neighborhood where I am living is a mixture of Arabs and French, and they seem to live in "harmony." Even though I have only been here for two months, it feels more than that. 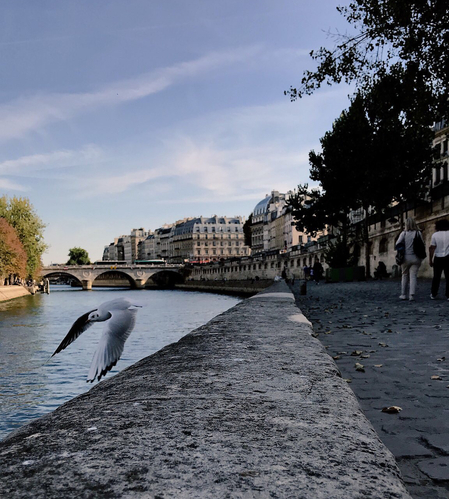 I discovered the beauty of the Louvre Museum, the Notre Dame Cathedral, the Eiffel tower, and the beauty of natural parks. Through the challenges encountered. I am discovering new things about myself, and despite the stereotype of the French being cold, I meet nice people everywhere. This journey is my story to tell others. Some might take such an experience for granted, but years of hard work have gone into this manifestation. Prior, I focused on my self-development, worked as a teacher and participated in exchange programs. Much self-doubt also clouded my years and my success during university. However, I reminded myself of my highest academic aspirations and persevered. After graduating with a Bachelors in Chemical Engineering, I was not able to find a related job since Libya was and is struggling both, politically and economically. A master's degree is the necessary next step for me. A master's degree will give me better chances of finding a job that is directly related to my passion for the environment. When I was very close giving up, my father told me, "Remember, without Malak, there is no hope," reminding me about how I always found hope even in the slightest actions, no matter how difficult the situation was or is. Whenever I get frustrated; his words echo inside my head and push me to keep going. I am learning new things on a daily basis, and I have more time to reflect on myself, on my points of strength and weaknesses, and how to be a problem solver. This article aims to inspire and advise individuals who may come from the same background as me. I hope to break the stereotypical image created for Libyan women, and I am delighted that there are many of us committed to changing this perception, in various and hybrid positive ways. I hope to encourage as many girls as to pursue their dreams.